The weather has been weird, sometimes frustrating, and occasionally outright frightening. Hawaii is looking at a little of the latter in what scientists are calling a meteorological first. 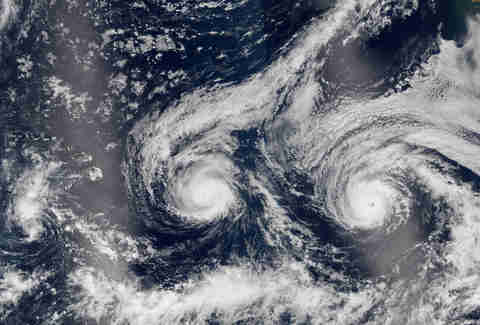 Two Category 3 hurricanes are barreling toward Hawaii right now. Both threaten to bring torrential rains and massive winds starting Thursday. The first of the two, Hurricane Madeline, could also be the first hurricane to hit the Big Island since bookkeeping began in 1949. It's moving west at 10 miles per hour with wind speeds of 120 miles per hour. It currently looks like it will skirt just south of the Big Island sometime Thursday, with its course largely sparing the other islands. Meteorologists say it's too early to say definitively where it's going to go, but the National Hurricane Center says that it will pass "dangerously close" to Hawai'i. It could bring 40-50 mile per hour winds and heavy rainfall. Weather.com points out that rainfall this heavy on the Big Island is frequently accompanied by landslides and mudslides. About 1,000 miles east of Madeline is Hurricane Lester, moving at a slightly faster pace and also carrying Category 3 winds. Lester is expected to pass north of Hawaii, though it should still be close enough to bring rain and winds to the islands not long after Madeline passes. Additionally, its course will bring its waves and winds to more of the islands than Hurricane Madeline will. Much of this is unprecedented. Hurricanes near Hawaii are rare, with conditions that facilitate their development tending to take place much further south. That makes two at once even more noteworthy. It's made possible, according to Weather Underground's Jeff Masters, by a combination of ocean temperatures two to three degrees warmer than usual and favorable atmospheric conditions. 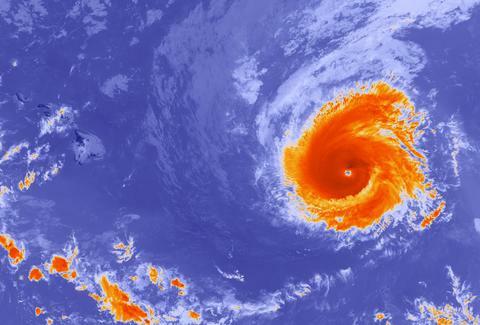 Hawaii county is under a Hurricane warning, but Masters offers a little hope in that Lester is catching Madeline and that may produce something known as the Fujiwhara effect. It happens when two hurricanes get close enough to each other that the winds begin to impact one another, which would push Madeline further south and Lester further north, an ideal situation for residents of Hawaii. Governor David Ige has declared a state of emergency, closed many schools, and opened shelters around the Big Island.